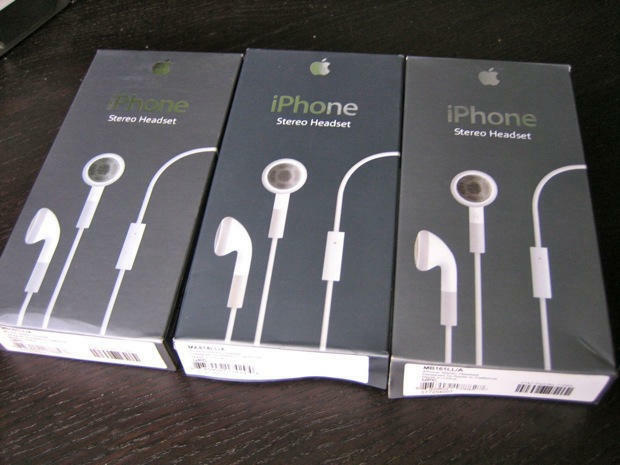 One of these iPhone headsets is from Apple; the other is a knockoff. Spot the difference? One of these is a $30 iPhone Stereo Headset from Apple. The other is a $14 knockoff from the Philippines. Thing is, the $14 copycat is as almost good as the original. It’s nearly physically indistinguishable. The sound is exceptionally good. And the microphone/remote works the same as it does on the genuine article. Even the packaging is remarkably realistic. Except there’s a few things that are off — a few minor details that give them away as fakes. Plus, they broke down after a week. These $13 knockoffs are as good as the genuine article. 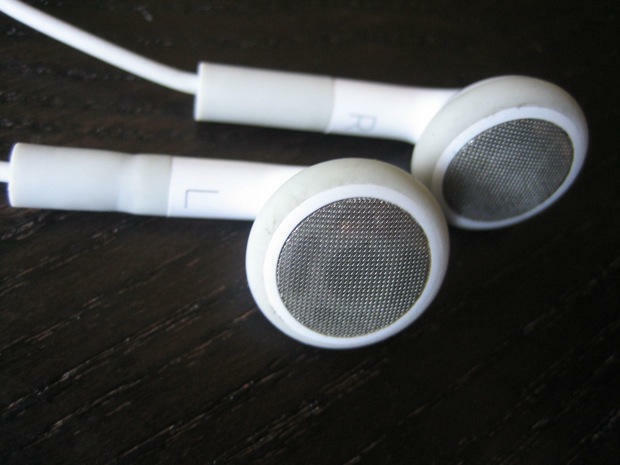 The fact that counterfeiters are ripping off $30 earbuds doesn’t surprise experts. Advertised as genuine Apple iPhone Stereo Headsets, I bought two pairs last month on eBay because they were half the price of Apple’s. Surplus or something, I thought. The eBay seller says they are based in New Jersey, but the earbuds were sent from the Philippines. Free shipping. At first I thought they were genuine. The packaging is perfect. 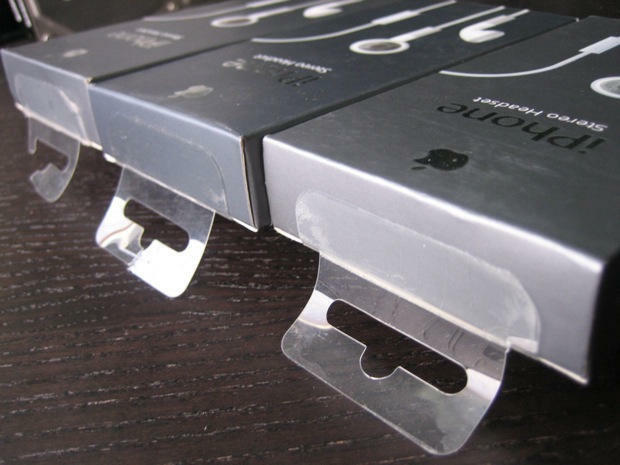 The box has all the Apple branding, and the same plastic tab Apple uses to hang the boxes from hooks in its stores. Inside, there’s the same white plastic pouch and a warranty pamphlet that’s an exact facsimile of Apple’s. The counterfeit earbuds have the same packaging as genuine Apple earbuds. That stuff is easy. Much harder is getting the nearly the same build quality as the genuine product. The knockoffs are as almost good as the originals, except in small details. They sound as good (and Apple;s headsets have remarkably good sound), and the cords are made from a similar, medium-duty, tangle-resistant rubber. The microphone, which doubles as a remote, works exactly the same. It answers calls, pauses and restarts songs, and skips to the next song if you double-click it — just like the genuine article. The functionality of the fakes is the same. The microphone/remote answers calls, pause music, and skips songs with a double-click. Everything was hunky dory until they broke down after just a week. One of the earbud speakers blew, and the mic/remote became extremely unreliable, pausing and starting songs at random, and frequently skipping to the next song. So I gave them a closer look, and noticed the microphone/remote has a slightly spongy feel. It doesn’t ‘click’ like Apple’s iPhone headsets. 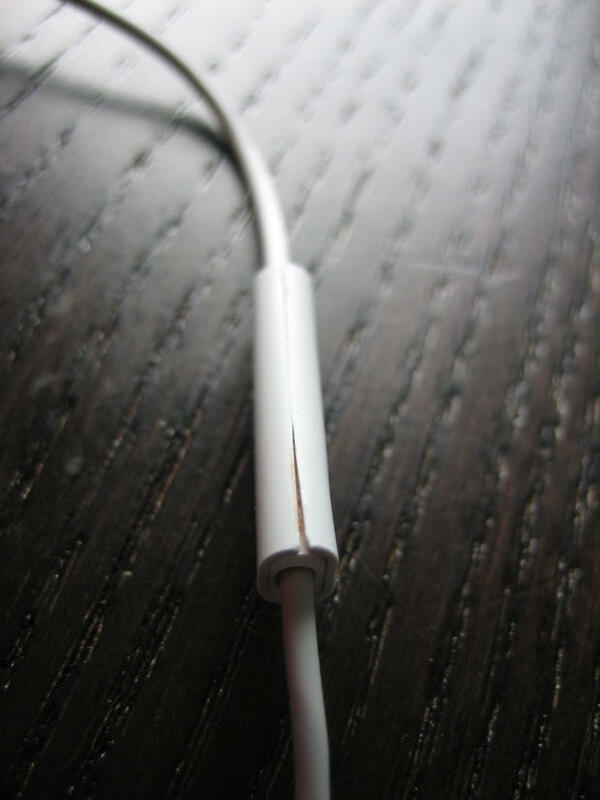 There’s also a little glue leaking from some of the seams — a manufacturing imperfection that would never pass Apple QA. 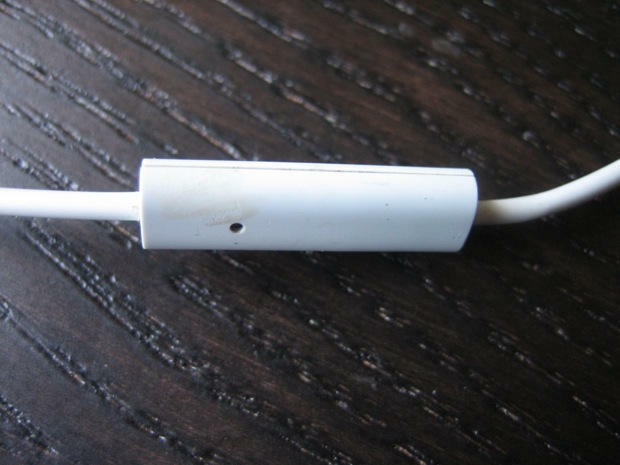 The microphone/remote has a 'spongy' feel and a smudge of glue that would likely fail QA in an Apple factory. 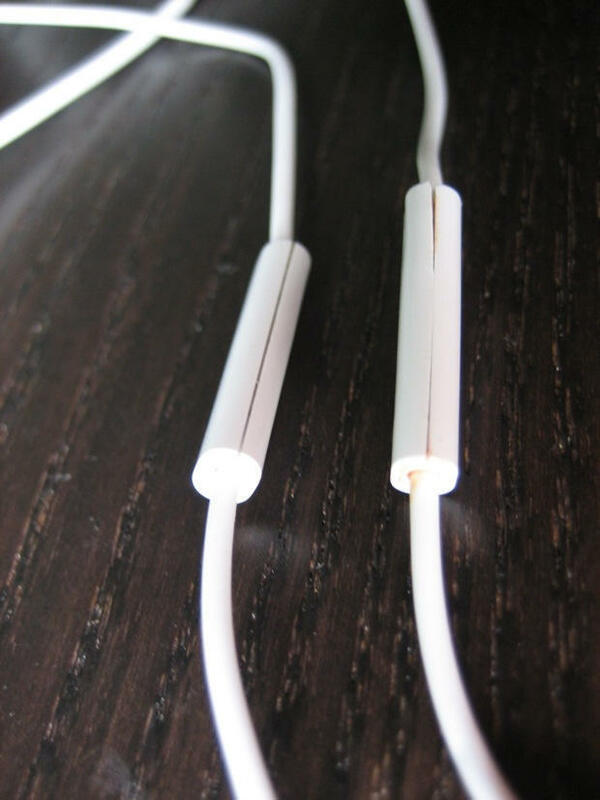 The wires are also a noticeably different material when compared to the genuine article. They are harder, not as pliant and rubbery. Then the boxes started to look a little funny. The printing isn’t right. It’s a little lower quality than Apple’s. It’s also a lighter shade — see the photos below. 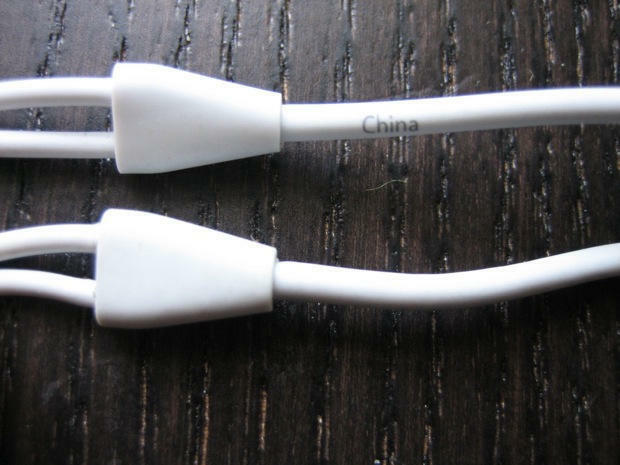 And then there’s a tiny “China” brand missing on the lanyard, next to where the wires split to the left and right ears. I opened the other pair, and the microphone/remote is noticeably badly assembled. The two halves don’t meet at the seam. Plus, it doesn’t work — at all. The microphone/remote on this knockoff headset was poorly assembled. Plus, it doesn't work. Another pair bought at the same time did work. Compare the knockoff on the right to the genuine Apple headset on the left. 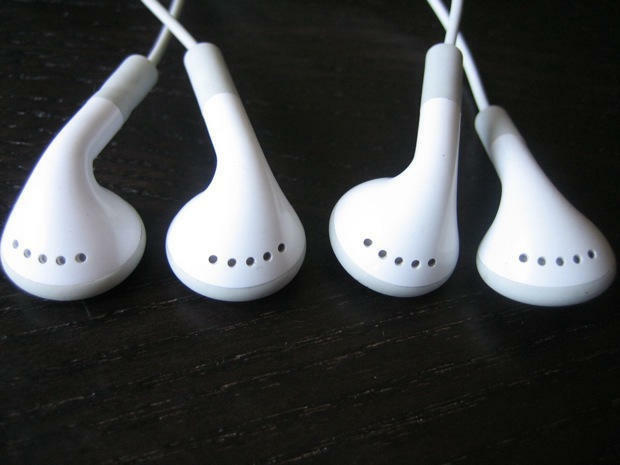 You can see that this particular pair of fake earbuds is shoddily put together. The fakes are so well made, there’s a chance they aren’t fakes at all. Maybe they’re Apple rejects. Instead of being recycled or trashed, they’re sold on the grey market. Or perhaps some of the parts are genuine Apple parts, bought from an official supplier, and some parts are knockoff. Or maybe they are simply older stock that’s being sold off cheap, and I just happened to pick two crappy ones. The eBay seller from the Philippines didn’t respond to messages asking for explanation or comment. Apple also didn’t respond to requests for comment. Jeremy Horwitz, editor-in-chief of iLounge, who has tested almost every iPod and accessory under the sun, said he’s seen plenty of counterfeit headsets. Horwitz said the iPhone Stereo Headset doesn’t contain particularly complex technology, making it relatively easy to copy. There were rumors last year that Apple’s new headsets contain a proprietary control chip that has to be licensed from the company. However, Horwitz says only the Apple Earphones with Remote and Mic that were released in late December contain the chip. 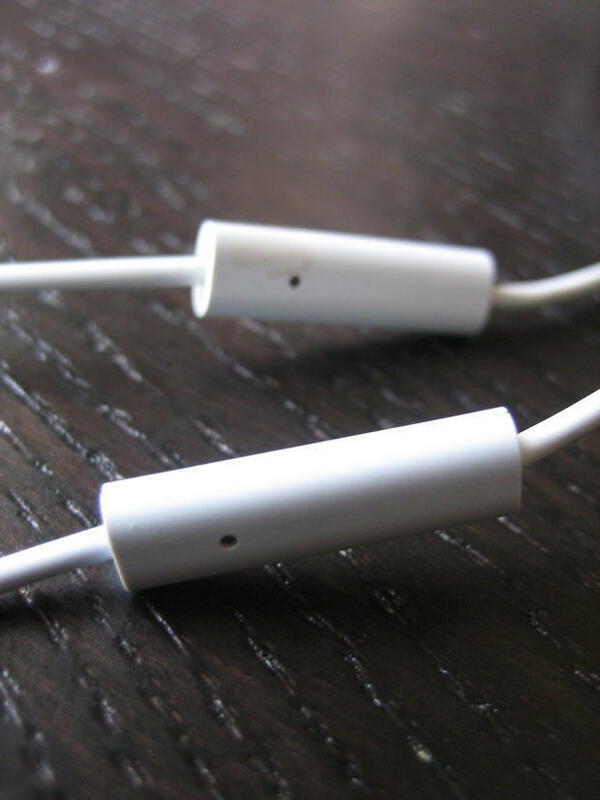 The iPhone 3GS headphones also likely feature the chip. The headsets that came with the original iPhone and the iPhone 3G are “comparatively simple,” says Horwitz. 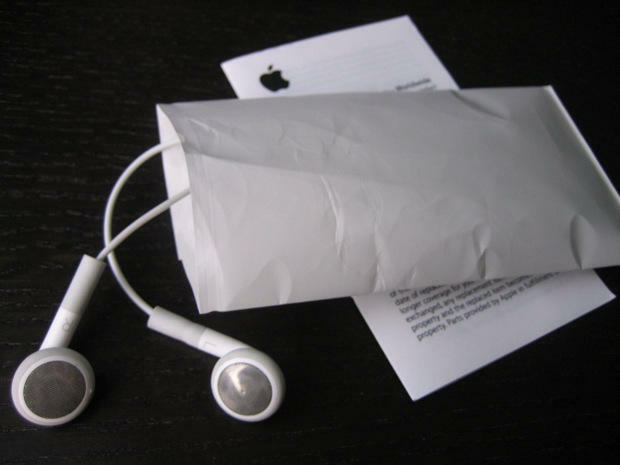 “Making a knockoff of the original Apple iPhone Stereo Headset is relatively straightforward,” he says. The audio manufacturer Shure has battled counterfeiters for years. In late May, the company helped Chinese authorities raid wholesale stores and warehouses full of knock headsets branded as Shure, as well as JVC and Audio-Technica. “Customers should be highly cautious of Shure products that are priced unreasonably low at retail outlets online,” the company warned. Two of these are fakes. The real Apple product -- purchased from an Apple store -- is the box in the middle. No detail is overlooked. The knockoffs even have the same plastic hooks.